Twelve suspects were arrested in connection with a plot to assassinate an active Tamil politician, the Colombo Crimes Division (CCD) told court last week. Colombo Chief Magistrate Lanka Jayaratne allowed the CCD to detain the 12 suspects for questioning about the alleged assassination plot. The arrested persons included members of the underworld and persons with connections to the LTTE. The CCD told court that their investigations had revealed plans to kill a Tamil politician on the instructions of LTTE cadres living overseas. Police declined to name the Tamil politician in its report to court, but sources said the target was likely TNA Jaffna District MP and TNA spokesman M.A. Sumanthiran. The suspects will be produced in court again on April 26. Meanwhile, earlier this month, Jaffna Mayor Emmanuel Arnold received a letter warning him about threats to three TNA politicians, including the ‘Spokesman’, Northern Provincial Council Member Sayanthan and the Mayor himself. Mayor Emmanuel lodged a complaint with the police in connection with the letter. His wife also received message on Viber with a picture of an open grave, the Arnolds complained to the police. The letter claimed knowledge of an attempt on the Mayor’s life and that of NPC Member Sayanthan and “spokesman” – apparently a reference to Sumanthiran – at the Chavakachcheri Hindu College in early March. “Please be careful. Better if you get a transfer for a few days,” the letter warned. 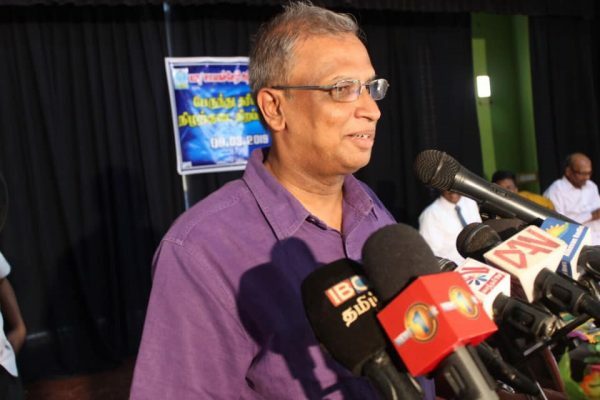 A Sinhalese language weekly in an expose this weekend revealed a plot to assassinate Sumanthiran, claiming the plot was to be executed shortly before the TNA MP left to attend the UNHRC sessions in Geneva. Four ex LTTE cadres have been indicted in the Colombo High Court by the Terrorist Investigation Division, after extensive investigations revealed they had been assigned with the assassination of the TNA spokesman in 2016-2017. TID recovered two claymore bombs in the custody of the accused. According to Police investigations, the group had attempted to assassinate Sumanthiran on four separate occasions. The attempts had taken place in the North during late 2016 and January 2017. « Former Navy Commander Jayantha Perera and Ex-Naval Intelligence Chief Ananda Guruge Allegedly Implicated in CID Investigations Into Disappearances of Vadivelu Loganathan and Ratnasami Parmananda Reportedly Abducted in Wellampitiya on January 11, 2009.